Smart way to get workout powders into your water bottle without messing. I stumbled across The Scoopie by accident while searching for something else online. It was curiosity that got my attention and I scrolled back to take a look. Simple ideas that solve recurring annoyances or problems always intrigue me. Why has nobody thought of this before? And why had I never heard of this inexpensive little genius tool? Within days, they became indispensible in my daily routine. Never heard of it? Don't worry. Until a month ago, neither had I and why, is completely beyond me. I keep in touch with fitness related products and accessories as much as the next person. I'm always on the lookout for something to make life easier, save time or keep me comfortable. Scoopies are plastic scoops, available in various capacities, with a snap-on lid that serves as a funnel when inverted. The aperture of the funnel part is sealed with a removable rubber stopper. I tend to only make time to write a review for things that I love and use at least almost daily, because I always appreciate it when others do the same. It helps to make informed choices about the best products to serve my needs when I can get information about the item. And like most people, I prefer to get that information from someone who actually uses the product on a regular basis, not just as a one-time test run. After posting a couple of short video clips of Scoopies in Action on my Instagram account, I recieved plenty of messages and some comments asking about them. I guess I'm not the first person who's only just discovered them! The Scoopie is available in a range of sizes and can be purchased individually, in pairs or in full sets. Determine where you want to use them, check the portion you measure from the product(s) and order what you need. I got a set of four because I use mine for pre- and post-workout mixes as well as for protein powders. Remove the standard scoop that came in your container. You won't need it. Pick the appropriate sized Scoopie and remove the lid. Scoop up your powder as usual and level it off. Snap the cap back on. 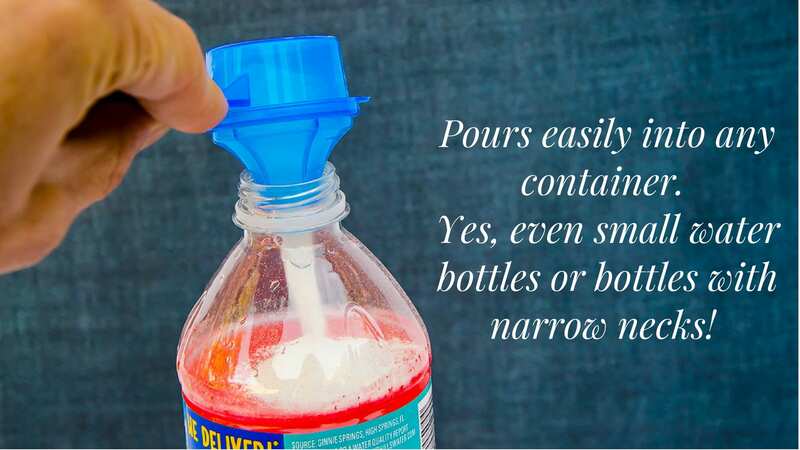 Pull the rubber stopper out of the top of the funnel, invert it over your water bottle and pour. 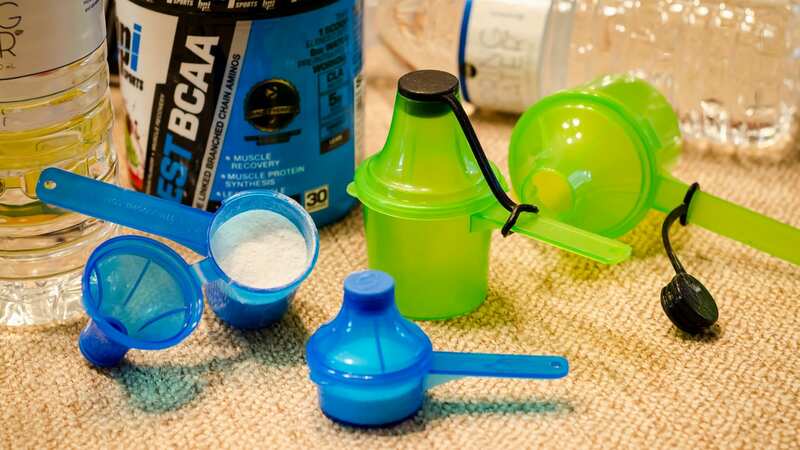 If you always mix your drinks and shakes at home, you can just leave the Scoopies in your container of powder. This works for me, but I also like to mix a post-workout drink straight after I'm done at the gym so I scoop, snap and seal the powder and throw it in my gym bag with a bottle of water. All set and ready to go. Now I know it's not just me! 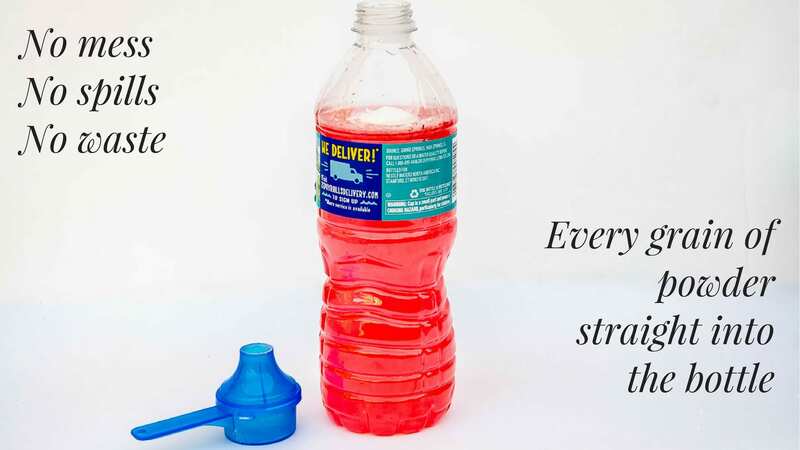 Who else has spent more time than it's possible to add up scrambling around for an old receipt or piece of paper to make a temporary funnel to try get your preworkout or postworkout powder funneled into a bottle of water without spilling? We have several sets of different sized plastic funnels in the kitchen cabinet. They live with the plastic containers. Yeah, those ones where you open the door and they all come tumbling out. Plastic funnels work great. It isn't that they don't do the trick. It's just that the funnel goes back to the kitchen so I can wash it. It never ends up where I'm trying to mix my BCAA's into a water bottle as soon as I get back from a run or from the gym. If you look closely, you'll see a little hole near the edge of the handles. Carabiner hooks are always on my gym bags so I can attach things there (usually stuff like hand sanitizer) for easy access. I'm going to get a set of miniature metal clasp rings to attach to the one that goes with me to the gym so I can attach it to the carabiner on my gym bag. 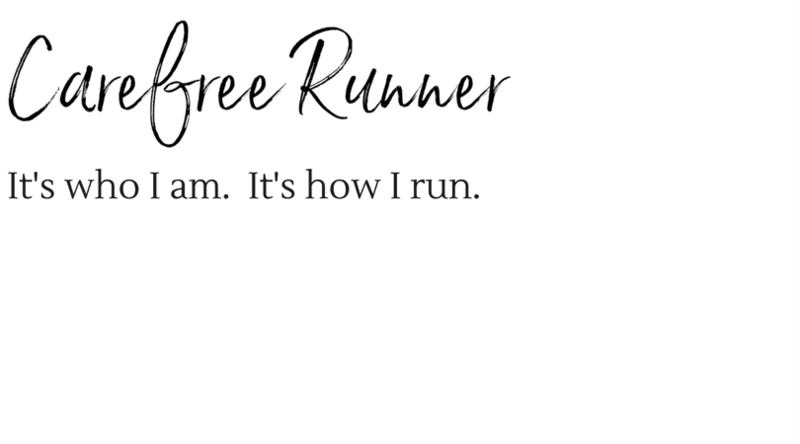 It will probably work on a waist belt for running, too! Hey, it's there. I'm going to find a way to use it to my advantage. 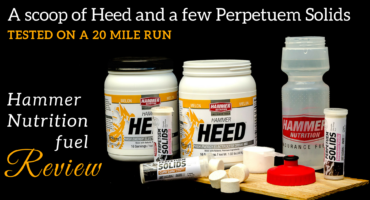 My purpose for these is – or was – solely for fitness related supplements in powder form. The Scoopie also has a baby formula scoop. Although I don't have a need for that, I wish I had a few of these when my daughter was still bottle fed. But there are other ways Scoopies are used at home now, too. Food prep is a huge time saver for me and I've found other helpful ways to use my scoop funnels. I use a french press for my coffee and I use the 60CC size to portion my ground coffee for the morning. My breakfast always has some ground nut powder, seeds and whatever else sounds like a good idea the night before. 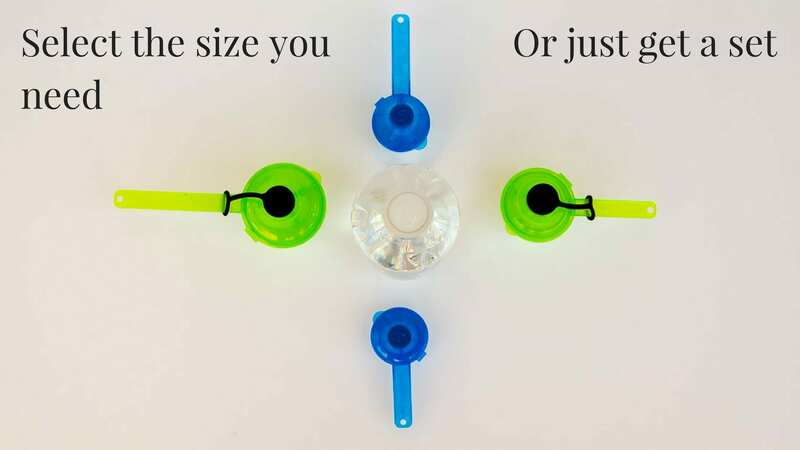 Now I can measure those out and set it on the dining room table, ready to pop the stopper and pour over my yogurt after my shower. It's also been a useful way to help my daughter exercise portion control for little extras that can quickly add up as extra sugar or calories without realizing. Basically I use my Scoopies for anything that fits in there and can be saved. Even my home made vinaigrette for my lunchtime salad gets set in the fridge, ready and waiting for me when I fly into the kitchen for what is sometimes a rushed lunch break. This week, while filling up the salt grinder from the large box of coarse sea salt, I realized I could just scoop it out and transfer the salt with a Scoopie. Saved me balancing the box and hoping the entire contents of the box wouldn't end up on the counter while pouring through a regular funnel. The opportunities are endless. All I know is that I need to get more of them so I don't have to share! Note: In my reference to using a Scoopie for salad dressing, mine is left in the fridge as I work from home. I am not sure how watertight these funnels are for carrying around and will need to check with The Scoopie folks and update you. There's no more grappling blindly, wrist deep in a two pound container of whey protein powder to find the standard scoop that got buried halfway down the first pound of the stuff. 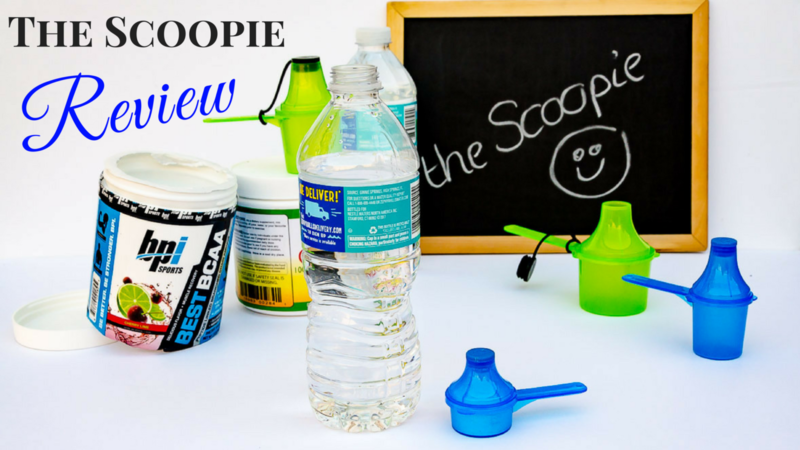 ALL the powder in the Scoopie pours right into even the smallest water bottle neck or sports bottle spout. No more sticky, tacky powder making the kitchen counters gritty. Or even more annoying, sticking to the floor and collecting on the soles of your shoes – you know, so that it can wipe itself off when you walk over your vacuumed carpets. Scoopies help me get organized. 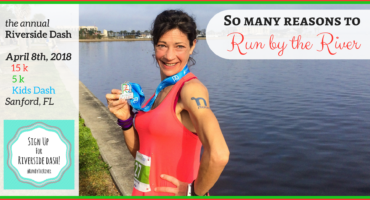 I run six days a week and leave at insane hours of the morning. Anything I need for my run and immediately after I get back, is prepared and set out the night before. Now I can measure my workout mixes and have them ready for the day before I go to bed. Set them out next to your water bottle(s) and you're good to go. The products are awesome. I can find no fault with them and the customer service is stellar! There are a few accessories I would really like to see added to the website in time to come. For example, stickers to put onto each Scoopie. Perhaps a choice of some for designating a purpose, like “Pre Workout”, “Protein Powder” and so on. I'm also intrigued by the little hole near the end of the handles. There may be a reason for these and I'm just not aware of the purpose, but I immediately spotted a way to tap into the benefit of the presence of the little gap. 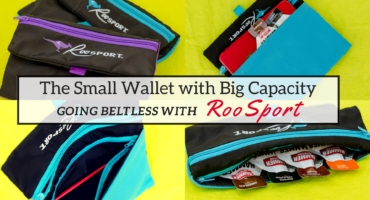 It would be great to see some little attachment that goes into the hole to allow you to clip The Scoopie onto a carabiner hook on a gym bag, diaper bag or whatever you are using to carry your workout mix. There are also T shirts, tank tops, muscle tops and hoodies on the website. I bought a tank top and it fits beautifully, came out of the washing machine and dryer like new and is super soft and comfortable. Actually that's how I found the website in the first place. I was looking for a black tank top and somehow ended up on the website after seeing one of the scoop funnels. If you are a Prime Member, there are Amazon Prime options as well. You can tell I am a fan. It was pretty much instant. And it's not like I dropped a ton of cash on something hoping to like it. These are simple, but clever little accessories that just make mundane tasks so much easier. I signed up to the newsletter because, firstly there are discounts and promotions that come up. A good deal is always welcome! I also discovered The Scoopie has a blog with some interesting articles and I want to know when new posts are up. The Scoopie comes with an enthusiastic recommendation from me. If you have questions, you can send them in via their website, or leave a comment on this post and I'm happy to check with them for you. If you have your own Scoopies, leave a comment and let me know your thoughts and experiences. And please share any useful ways you have found to use them, both at home and on the go. My review of The Scoopie products is written based on my personal experience. I did not write this at the suggestion or request of the Scoopie. I selected and purchased the items I wanted directly from the website as a customer. All photographs and views in this article are my own. Had no idea they existed! Just purchased. Thanks! So glad you found them. I’m always on the go and try to get things prepped the day before and I’ve accumulated quite a collection of these handy little funnels.